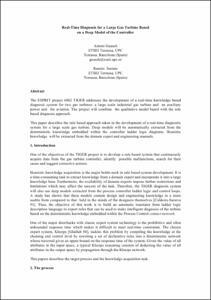 The ESPRIT project 6862 TIGER addresses the development of a real-time knowledge based diagnosis system for two gas turbines: a large scale industrial gas turbine and an auxiliary power unit for aviation. The project will combine the qualitative model based with the rule based diagnosis approach. This paper describes the rule based approach taken in the development of a real-time diagnostic system for a large scale gas turbine. Deep models will be automatically extracted from the deterministic knowledge embedded within the controller ladder logic diagrams. Heuristic knowledge will be extracted from the domain expert and engineering manuals. Guasch, A.; Sarrate, R. Real time diagnosis for a large gas turbine based on a deep model of the controller. A: Workshop on Integration in Real-Time Control Systems. "Workshop on Integration in Real-Time Control Systems". Miraflores, Madrid: 1993, p. 14-1-14-5.